Premiere Cinemas has announced this year's winners of the Mary Hamby Memorial Scholarship. The award is given annualy to well-deserving young men and women in Hereford, Texas who work for Premiere Cinemas and intend to pursue their higher-learning after graduating. This year's winners have achieved excellent work-histories in the entertainment business serving movie-goers in Hereford and have graduated with honors. 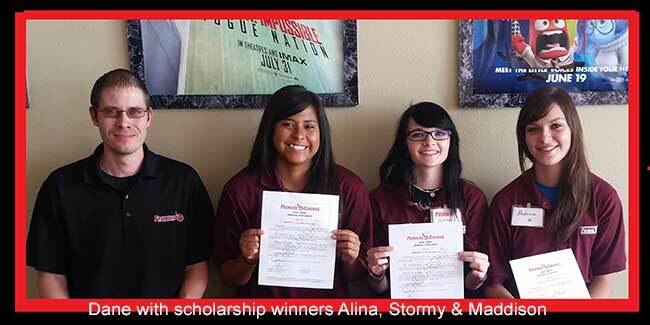 Scholarships were presented to outstanding crew members Stormy Cash, Alina Villalovas, and Maddison Watts, all of Hereford, Texas, who will be attending Amarillo College, Texas A&M University and Ft. Hayes State University as they continue their eduction. Premiere started the Scholarship in honor of long-term Premiere Director and Hereford resident Mary Hamby. "Mary loved teaching teaching and working with young adults in and around the theatre during her years with Premiere," said Joel Davis, Premiere's Director of Operations. Ms. Hamby passed away in 2008 after a brief battle with cancer. Theatre Director, Dane Cash, encouraged all graduating employees to enter an essay describing their experience in show business and plans for their future careers. The three cast members' were then selected on the merits of their academic and professional achievements, and goals for the future. "We are really proud of all three of them," said Mr. Cash. "It's been a pleasure having them on our team and I know they will all be successful in their endeavors. We are thrilled to be able to assist in their education, we couldn't do it without our loyal customer base who helps support the cinema so we can in turn support the community like this."